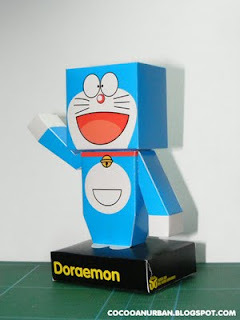 Doraemon is the titular robotic cat sent back in time by Sewashi to aid Nobita. He possesses a fourth-dimensional pocket from which he can acquire various kinds of futuristic tools, gadgets, and playthings from a future department store. Doraemon originally had ears but they were bitten off by a robotic mouse in the 22nd century. As a result, he developed a morbid fear of mice despite being a robotic cat. He also has the tendency to panic during emergencies, characterized by him frantically trying to pull out a very much-needed tool from his pocket, only to produce a huge assortment of unrelated household items. Doraemon's physical appearance changed as the manga progressed. At first, he was predominantly blue, with a blue tail, a white stomach, and flesh-coloured hands and feet. He also stooped, and had a body much larger than his head. In later issues, he sported a smaller body, white hands and feet, and a red tail--the appearance most identify him with today. 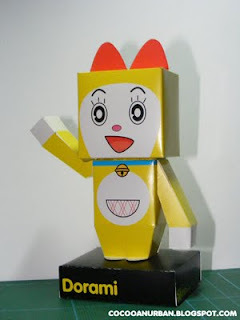 Dorami, also known as Dorami-chan, is the sister of Doraemon. She happens to be about 2 years younger than him. Strangely enough, they are siblings due to the fact that they shared half of the oil from a can. She lives in the 22nd-century Tokyo with Sewashi, Nobita's great-great-grandson. She is yellow and has ears that resemble a large red bow. She likes melonpan and is afraid of cockroaches. She is also shown to be a more advanced robot than Doraemon (Dorami is able to produce 10,000 horse power, in comparison to Doraemon's 129.3). She sometimes visits Nobita with a time machine when Doraemon is "off-duty" or to help Doraemon with something. She also has her own spin-off manga. 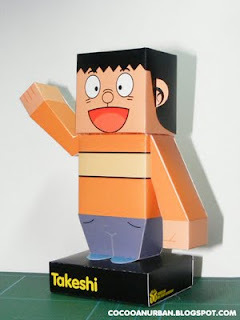 Nobita is the main character of the series and the center of the story. He is a fourth grader in Tokyo's Nerima Ward and an only child. He wears glasses, a red or yellow polo shirt with a white collar, and blue shorts. Nobita's character flaws are endless: he is lazy, uncoordinated, dim-witted, frail, plain-looking, unlucky, and bad at sports. Nobita's typical day consists of arriving late on classes, scoring zeros in his tests, getting lectured by his teacher, being bullied by his classmates Gian and Suneo, falling into curbside rain gutters, being chased by dogs, and getting scolded by his mom for his sloth and poor academic results. Despite his flaws, Nobita possesses some unique talents such as his unrivaled marksmanship and ability to weave intricate string figures. Although Nobita is usually portrayed as being cowardly, he has often risked his life to help save others or even entire civilizations (as seen in full-length stories). He has a tendency of acquiring a grade of zero every once out of five tests and has only scored perfect once in his lifetime. Nobita also has a talent for finding unusual applications for Doraemon's gadgets, and to abuse them, which usually gets him into trouble. Despite everything, Doraemon succeeds on his mission, as seen in several episodes in which they travel to the future and the short Nobita's the Night before a Wedding. Nobita eventually marries Shizuka and has a son who, in a generational role reversal, bullies Gian's son. 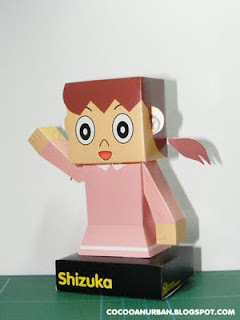 Shizuka, usually called Shizu-chan (静ちゃん?) or Shizuka-chan (静香ちゃん? 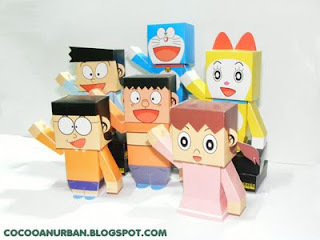 ), is the smart, kind, and pretty neighborhood girl who is the object of Nobita's affections. She takes baths several times a day. Nobita often disrupts her in the bath due to some misuse of Doraemon's gadgets, resulting in Nobita's head getting dunked. She is also known for taking piano lessons unwillingly, which is sometimes used as an excuse for declining to hang out with Nobita. Her true passions are sweet potatoes, which she'd rather keep to herself out of the knowledge of others, and the violin, in which her playing is as atrocious as Gian's singing. Due to Doraemon's intervention, Shizuka will become Nobita's wife in the future timeline, and the mother of his son. Suneo is the fox-faced (inherited from his mother) rich kid who loves to flaunt his material wealth before everyone. He is often seen with Gian, serving as Gian's lackey while they bully Nobita together. Some of the stories start with Suneo showing off some new video game or toy which evokes Nobita's envy. He has an extensive knowledge of science, and is a talented artist and designer. He has the habit to invite Gian and Shizuka to something or someplace, but always leave Nobita out with one excuse or another. In some scenes, Suneo is seen as a narcissist who loves to stare at himself in the mirror while telling himself that he is the most handsome guy in the world. He is still a bed-wetter and needs to wear diapers when he sleeps, despite being in the fourth grade. He considers this humiliating habit his secret weakness. 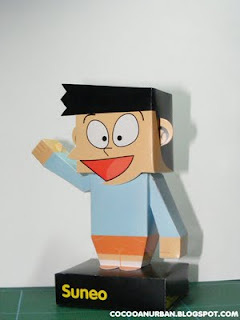 Suneo is also very self-conscious about his height, being the shortest kid in his class. Takeshi, usually known by the nickname "Gian" (ジャイアン, Jaian?) from English word "giant", is the big, strong, and quick-tempered local bully. His nickname may be derived from giant. He is known for his confidence in his terrible singing voice, though he considers himself a great singer. He regularly subjects the neighborhood children to horrendous singing recitals, which is sometimes combined with his equally bad homemade dinner and his atrocious fashion sense. He also frequently steals other children's toys and books under the pretext of "borrowing" them, unless the toy is damaged. This is how most fans considered Gian to be a major antagonist mostly to Nobita and his friends. However, he does not hesitate to help them, including Nobita when they are in real trouble, which often occurs in the movies. 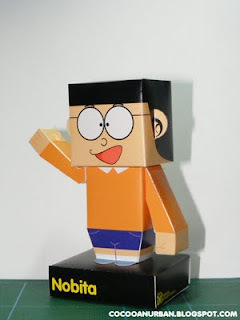 Several of the stories revolve around Nobita and his friends' efforts to avoid Gian's concerts or in one particular episode or chapter, which summarize his friends avoid visiting Gian's house on his birthday because of his selfish nature. After reflecting on one event about his birthday, Gian thought of himself why he wasn't popular among his peers. After getting a lecture from Doraemon to see what an unruly character he is, Gian realize that he should've been a better person and he begs Doraemon to give him another chance. However, things didn't go exactly as planned when his friends at school or at the streets mock him to see how weird Gian was acting and get kicked by Suneo after learning his attempt to become gentle to his peers. This led him to lose control of his temper and start attacking his friends again. Although he bullies the other children (mostly Nobita), he is terrified of his mother, who runs the local grocery store. He founded his own baseball team named after himself. Although Nobita is often blamed for the losses against the baseball team's rival, the "Tyranos", Gian and Suneo still force Nobita to play because they do not have enough players. teruskan upaya mempopulerkan budaya lur!